“I have the honor to lead the foundation with liberal principles and in the liberal direction. Liberalism is not only a political program. It is culture. It is a character,” said Dr. Wolfgang Gerhardt, President of the Friedrich Naumann Foundation for Liberty (FNF), at his speech during the Farewell Reception of the Liberal International (LI) 57th Congress in Manila, Philippines on 19 June 2011. Gerhardt highlighted the contributions of Friedrich Naumann whose ideals became the guiding principles of FNF. He stressed that while Naumann was part of the constitutional committee of the Weimar Republic, he was aware that written laws were not enough to ensure a free society. Political education, which is the main work of FNF today, was pursued to build a functioning democracy with politically informed and educated citizens. The visit of Gerhardt to Manila is likewise to attend the 25th Anniversary of FNF Philippines. FNF opened its office in Manila after the People Power Revolution in 1986. It has since established partnership with the Liberal Party of the Philippines, which is the first LI full member in Asia, and is now the party in government. “We have partners here, a strong Liberal Party, and the President is our friend. 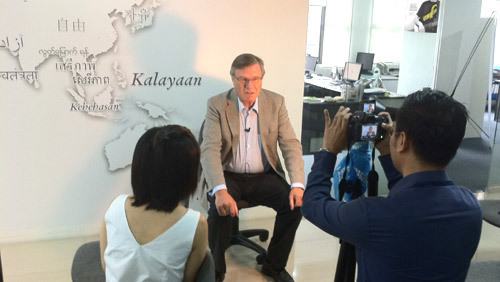 We love to be here,” expressed Gerhardt when asked about FNF Philippines’ importance in the work of the Foundation. Gerhardt inaugurated the office’s Freedom Wall that reflects the word freedom in different languages and where people can write messages about freedom. FNF Treasurer Manfred Richter, and Head for International Programs Ulrich Niemann were present during the event as well. At the LI Congress, Gerhardt also awarded the FNF medal to LI President Hans van Baalen. van Baalen, who has been reelected as LI president acknowledged its membership. “I can only as president be effective in an organization that works when we have people committed to freedom. Therefore, this medal is our medal, and it is given by the real party for freedom in Germany,” said van Baalen referring to the Free Democratic Party (FDP).